The Mess Summer Ball – often the highlight of the year for many military establishments. A chance to dress & impress with the opportunity to enjoy the remaining mess funds before summer leave commences! However use your budget wisely as the key to good entertainment is quality not quantity! During the drinks reception a brass quartet, trad jazz quintet or string quartet will provide an enjoyable atmosphere either inside or outside. For large scale events a military band performing a traditional ‘beating the retreat’ may be more appropriate, however with a shortage of serving bands these days, you may need to book at least 12 months in advance to have any chance of securing a band. Kaleidoscope will be pleased to assist whenever help is required. Should a serving band be unavailable, we can offer one of our civilian military style bands made up primarily of ex serving and serving musicians. 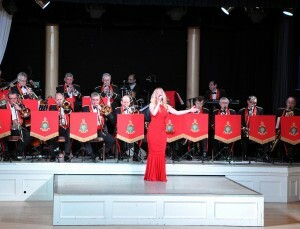 As the summer ball is generally more relaxed than the traditional regimental dinners, a dance band or swing band will provide an uplifting atmosphere during the sit down meal. Table magicians and caricaturists can also be a fun way of entertaining guests between courses. After dinner entertainment should be the main area of spend, as your guests will be expecting something special to dance to. A professional large party band with a good sound system and lighting rig will provide everything you need for a full dance floor. For assistance or initial ideas, please call or email anytime.